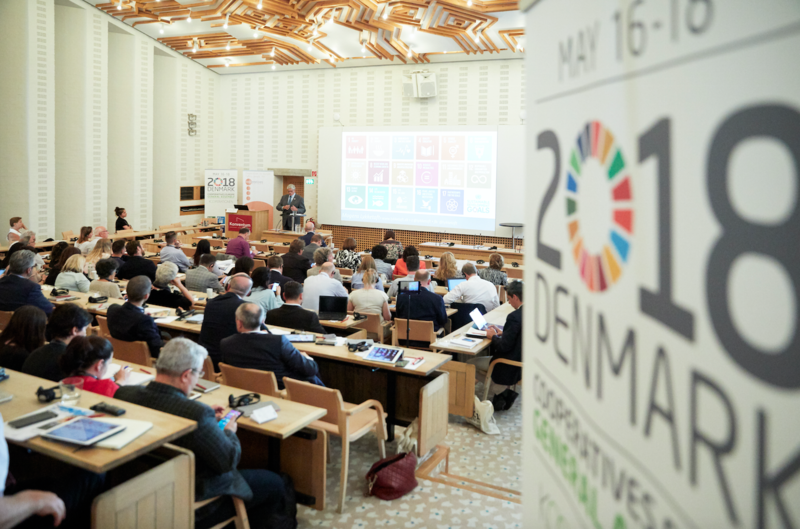 The 2018 Cooperatives Europe General Assembly took place between 16-18th of May in Helsingor, Denmark. Hosted by Kooperationen focusing on the role of cooperatives for achieving the Sustainable Development Goals, ”, the delegates of European cooperative movement gathered to inspire, exchange and develop actions to further the impact of people-centred enterprises. The 2018 GA theme focused on Global Sustainable Development Goals. Cooperatives are the key actors in delivering change through sustainable, people-centered enterprises worldwide. Our unique model bridges the gap between the social and economic, allowing for impact-driven activities in every sector. Thus, Sustainable Development Goals should be part of every cooperative in all countries, going beyond, but including, the perspective on international development. The role and success of cooperatives in addressing inequalities, social exclusion and the crises faced was highlighted by President of Jean-Louis Bancel in his introduction to the participants. Mogens Lykketoft, the invited key-note speaker and former President of the United Nation’s General Assembly, in his speech emphasized the role of women, embracing renewable energy, and innovation among other topics, warning of impossibility of achieving an equal social and economic world without a fair distribution of resources and urging cooperators to take action concerning each UN’s Sustainable Development Goal. The power of the Danish cooperative movement was introduced by Susanne Westhausen, CEO of Kooperationen and VP of Cooperatives Europe, whereas an extensive overview of Denmark’s actions and commitment to the SDGs was brought forward by Kristen Brosbol, the Former Environment Secretary, MP and Chairman of Danish Network for the SDGs. Her assessment brought cooperative model and in its relevance to SDGs forward as an example for other companies. Opportunities on the EU level as well as intercooperation for successful development worldwide were discussed by European Commission’s Patrick Delvetere. Our role on the international level was also highlighted by Ariel Guarco, the new President of the ICA who put forward the role of the ICA in answering the needs of its members while increasing visibility. #MyCoopStory competition award ceremony brought SDG5: gender equality to light through the inspiring projects presented by the winner Ana Teskera (Hr) from Brlog Cooperative Brewery and Tania Castro (Es) from Women with Energy Coop. Watch their videos here. The Young European Cooperators Network, who also judged #MyCoopStory with Kooperationen, were also invited to participate to the activities of #CoopsEU18 bringing a youth voice to workshops and open sessions, including an intervention by Lorenzo Novaro, the newly elected representative of the network. Representatives of the cooperative movement, practitioners and academics exchanged on how, in practice, cooperatives could and should enter the collaborative economy. They stressed on the needs and challenges met by cooperative platform start-ups to emerge and scale-up. The audience also exchanged on strategies implemented by existing cooperatives to adapt their business models to the digital society, as well as opportunities to campaign for community buyout of existing platforms. Cooperative model for gender equality: where do we stand? The workshop was devoted to the launch the European network of women cooperators underlining the contribution of European cooperatives to achieve empowerment for all women and girls and to better understand where European Organisations and cooperatives stand in terms of gender equality. Several speakers, coming from the EU Commission, Danish Civil Society organization, national cooperative organizations and businesses from Italy, Spain, UK and Norway presented their experiences and recommendations, to be used by the Network in the future. A workshop on international cooperative development celebrated the 10th anniversary of the Cooperatives Europe Development Platform (CEDP) and its achievements, and showcased cooperative best practices on renewable energy, migration, and ethical consumption – highlighting the links between European initiatives and their global outreach to support international development. The General Assembly allowed for exchanges of Members with the Board of Cooperatives Europe and saw the admittance of 4 new members. The Annual Report detailing the activities from May 2017 to April 2018 were approved and are available for viewing here. Cooperatives Europe would like to thank the hosts Kooperationen, all the participants and speakers for bringing SDGs and the key role of the European cooperative movement for their implementation to the forefront.